The homes are made from recycled metal shipping containers with renovated interiors to be used as living spaces. 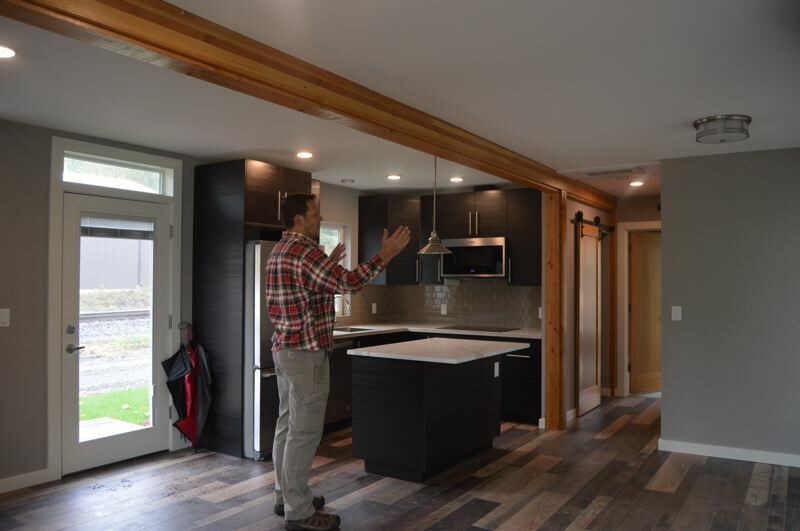 Coffman pitched the concept in early 2017 as a way to bring more affordable housing to St. Helens, while also pursuing an innovative home development design focused on reusing materials. The proposed complex at 7th Street has been dubbed the "7th Street Container Lofts" complex and is just west of 6th Street Park. 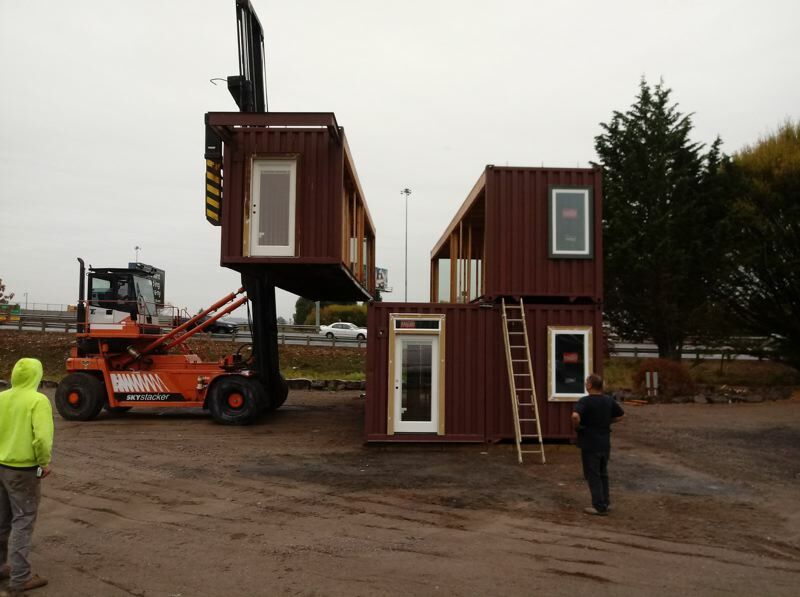 A walking tour inside the model units earlier this month with Matt Melton, sales director for Relevant Buildings, demonstrated exactly how the containers are transformed from corrugated steel boxes into living spaces. While the outside of the unit has an industrial aesthetic with brick-red paint, corrugated walls and text markings from its previous life as a shipping container still intact, the inside has a modern and clean appearance with slate-gray walls and accents of exposed wood and dark cabinetry. Each condo unit will be made from two 40-foot-long shipping containers set side-by-side. The containers are joined by a glulam, which is made up of several laminated pieces of wood glued together to provide support and structure. With large windows and efficient use of sliding barn doors, the 640-square-foot home feels spacious and roomy. Many people enter and comment on how surprised they are that it looks like a home and not a metal box, Melton said. The one-bedroom units feature a full kitchen, bathroom with a shower, living room, dining area and utility closet for a washer and dryer. The current goal is to keep the sale price of the home in the $150,000 range. The design for this home model is called the Suite Spot, Melton said, explaining how the unit is mid-range in size and price for the homes Relevant plans to sell. "For affordable housing, there's this wrestle between something cheap and something that's too nice, and then it's not affordable," Melton said. Currently construction crews can create one of the container unit homes in about eight weeks. The hardest part of the process is figuring out how to cobble the units together and connect utilities when the homes are stacked, Melton explained. The homes are being constructed at a facility in Canby. Crews are currently working on the fabrication of the first two homes that will be installed in St. Helens. Ultimately, the developers hope to be able to construct the homes, tarp them and bring them to the city ready to be hooked up to utilities. Crews are also working on site in St. Helens to prep the foundation for the units. While the homes may be more modestly sized, Melton said the company is trying to distinguish itself from the tiny-house market. 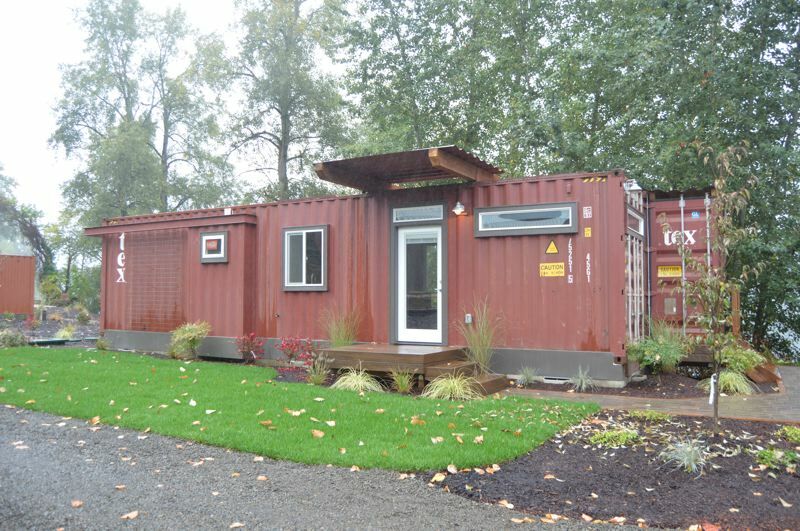 "We are container homebuilders. Tiny homes are really built to (recreational vehicle) code. These homes are built to residential code," Melton added. Public-private partnerships like the one that is being established in St. Helens provide an opportunity to build the units without forcing homeowners to purchase buildable land first, which can be a challenge, Melton explained. While the homes may not be suitable for everyone, Melton said he's heard from at least one person in St. Helens already who is interested in purchasing one of the condos when it's built. "This can be a good option for affordable housing — we can hopefully just sell these and get them on the first rung of home ownership," Melton said.